Human Rights in Masoala is dedicated to drawing attention to injustices committed against the local population in Masoala, Madagascar, in the name of Nature Conservation. 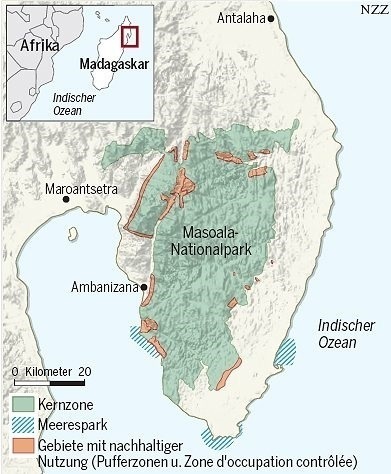 The Masoala National Park was inaugurated in 1997 and comprises half the Masoala peninsula on Madagascar’s northeast coast (see map below). The park enjoys the support of various North American and European conservation organisations (among them the Wildlife Conservation Society and the Zurich Zoo). Many farmers in Masoala have lost a substantial part of their customary land when it was included into the park. By encapsulating the land local people rely on for their subsistence, the park has caused increasing poverty among an already poor population. Moreover, it threatens the livelihood of future generations. Local farmers, therefore, strongly disagree with the park’s present extension and boundary. “Añaty rôva izahay”, they would often say: “We are trapped like chicken inside a chicken coop”.